20% L-ascorbic Acid And Raw Kombucha. Infuses Your Skin With Live Probiotic Cultures Vitamin C, Enzymes And Other Nutrients. Instantly Firms, Moisturizes And Smooths Fine Lines And Wrinkles. Provides An Immediate Youthful-Healthy Glow. Raw Unpasteurized Kombucha has become the go-to product for increasing the friendly probiotic bacteria in the digestive system. Unlike supplements it survives the acid environment of the stomach and delivers millions of friendly bacteria, enzymes, B vitamins and other nutrients to the digestive system and can do the same for your skin. Your skin has a micro flora living on and in it that is almost equal to your digestive system. The latest research is proving that the health and quantity of friendly bacteria in this delicate system has a major impact on the health and appearance of your skin. These tiny friends of ours are involved in so many processes that benefit our skin its projected it will take the scientific community decades to get a solid understanding of the full extent of their involvement. However we do know they play a role with UV protection, collagen and elastin formation, faster wound repair, increased moisturization, antioxidant and anti-glycation activties, improving skin issues like acne, rosacea, rash and eczema and reinforcing the protective acid mantle of the skin. This micro flora Imbalance contributes to accelerated skin aging making wrinkles, fine lines, rough dry skin, breakouts, rash, eczema, sagging skin and age spots more likely and apparent. If you care about the appearance and health of your skin then improving this micro flora is just simply logical. The reason you haven't seen live probiotics in skin care until now is because heat and chemicals kill them. Over 99% of skin care products are made using some level of heat and chemicals and that includes the organic and natural category. Making this Vitamin C serum with Kombucha was difficult however we accomplished it using a trade secret process we developed, that keeps the probiotic cultures in suspended animation until released onto the skin. This process seals the kombucha in microscopic gel-like structures made from food that keep them from multiplying until your fingers start spreading the product and releasing them into your skin. The serum also delivers liposomal L-ascorbic acid deep into the skin along with enzymes, B vitamins and many other nutrients boosting your skin's nutrient status beyond optimal. 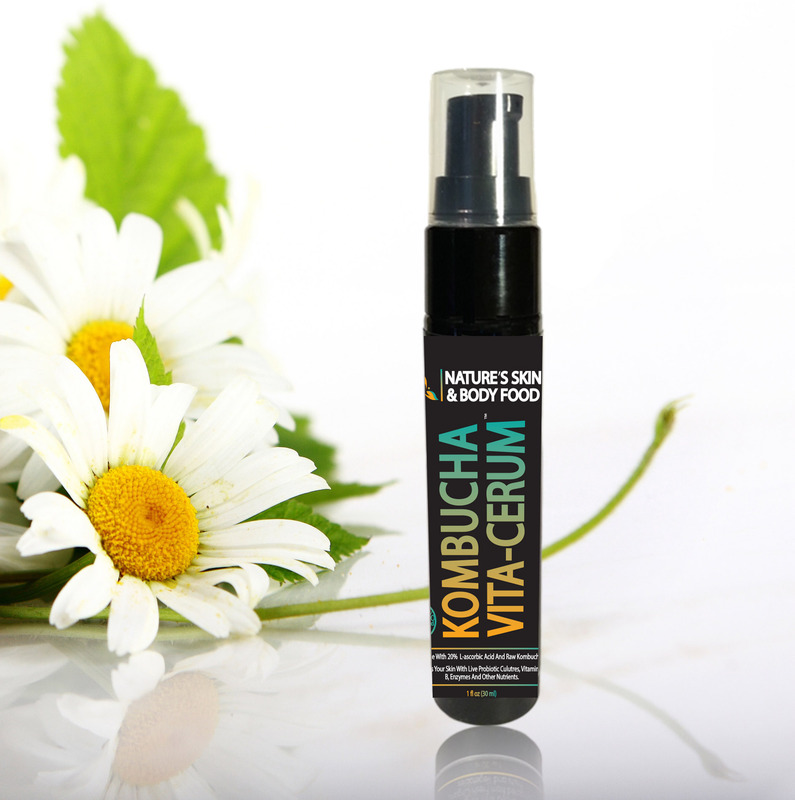 If you use a Vitamin C serum now or considering using one, nothing is going to compare with the benefit of Kombucha VitaCerum. Try this product risk free its backed by a 100% money back guarantee. Instructions: Apply A Small Amount 1 or 2 Pumps To Face And Neck. 1 or 2 Times Daily. Can Be Used Under Makeup, Moisturizers Or Other Skin Care Products. Best Results Are Acheived With Application Before Bed Without Any Other Skin Care Product Applied.